There are three types of bluefin tuna: Pacific, Atlantic and Southern. Tokyo Tsukiji Market is the largest wholesale market of bluefin tuna. 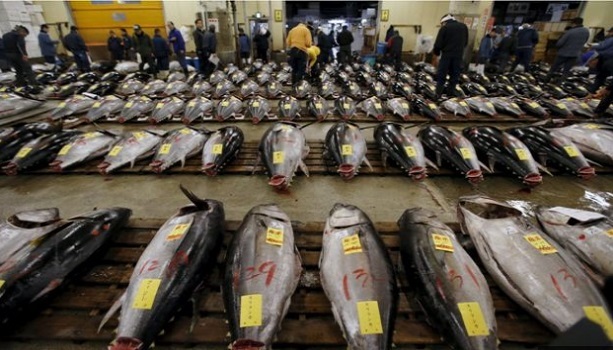 In 2013 a 222 kl tuna was sold for $1.8 million or $8,000 a kilogram (2.2 lb). About 80% of the Atlantic and Pacific Bluefin Tuna is consumed in Japan. As early as the 1960’s bluefin tuna (including Pacific, Atlantic and Southern) was sold for pennies a pound and was used to make cat food. 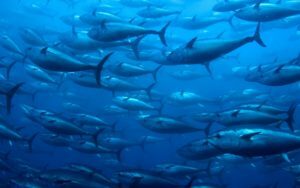 According to the Pacific Bluefin Tuna Working Group (PBFWG) the species is overfished as there has been a decline of between 20 to 33% of stock during the last 22 years. This species is listed as Vulnerable by the IUCN. The Inter-American Tropical Tuna Commission (IATTC) and the Western and Central Pacific Fisheries Commission (WCPFC) are responsible for the management and conservation of the Pacific Bluefin Tuna setting annual commercial catch quotas. The Pacific Bluefin Tuna is found mostly in the North Pacific ranging from East Asia to the North American West Coast. It spawns in the Western North Pacific at water temperatures above 68ºF (20ºC). Juveniles migrate from the Western Pacific to the Eastern Pacific where they stay for a few years and then they make their way back. They have been spotted as far north as Russia’s Sakhalin Island in the Western Pacific and the Gulf of Alaska in the Eastern Pacific. 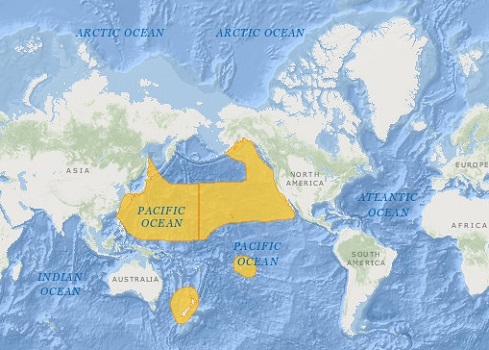 In the south their range expands as far south as New Zealand in the Western Pacific and Baja California in the Eastern Pacific. Its skin is metallic blue on top and silver on the bottom. Its coloring serves as camouflage. This species can reach a maximum of 9.8 feet (3 meters) in length and a maximum weight of 1190.5 lbs (540 kg). The largest Pacific Bluefin tuna was caught in New Zealand and weighted 906 lbs (411 kg). Bluefin tuna is a voracious predator that feeds on anchovies, sauries, hakes, squid, shrimp and crabs. They can be found at depths of 550 meters. When it is not spawning season they congregate in the Pacific to form feeding aggregations. They group together in schools based on size and not on species. It is common to see blue fin tunas with many different species in a school. The adult Bluefin is a pelagic fish, they live in the open sea neither close to the bottom nor near the shore. The Pacific Blue fin tuna matures at 3 to 5 years old when they are 110 to 132 lbs (50 to 60 kg) or 3.3 to 4.9 feet (1 to 1.5 meters) long. Spawning occurs in April, May and June between Japan and the Philippines, in July off southern Honshu and in August in the Sea of Japan. Females lay from 5 to 25 million eggs depending on their size. The life expectancy of the Pacific Bluefin is from 15 to 26 years. Predators includes sharks, killer whales (orca) and humans. Asian Pacific Journal – Facing Extinction: Can the Pacific Bluefin Tuna be Saved?